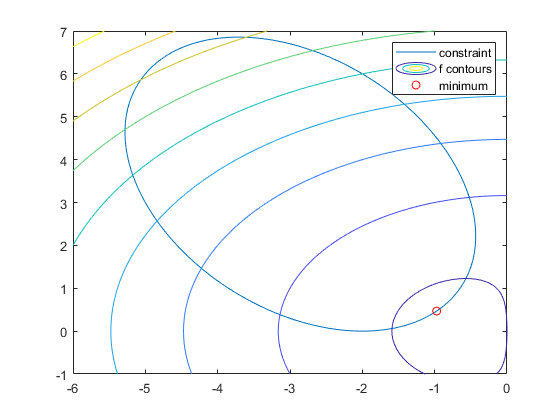 This example shows how to use two nonlinear optimization solvers and how to set options. The nonlinear solvers that we use in this example are fminunc and fmincon. All the principles outlined in this example apply to the other nonlinear solvers, such as fgoalattain, fminimax, lsqnonlin, lsqcurvefit, and fsolve. The example starts with minimizing an objective function, then proceeds to minimize the same function with additional parameters. After that, the example shows how to minimize the objective function when there is a constraint, and finally shows how to get a more efficient and/or accurate solution by providing gradients or Hessian, or by changing some options. The plot shows that the minimum is near the point (-1/2,0). We will now pass extra parameters as additional arguments to the objective function. We show two different ways of doing this - using a MATLAB file, or using a nested function. 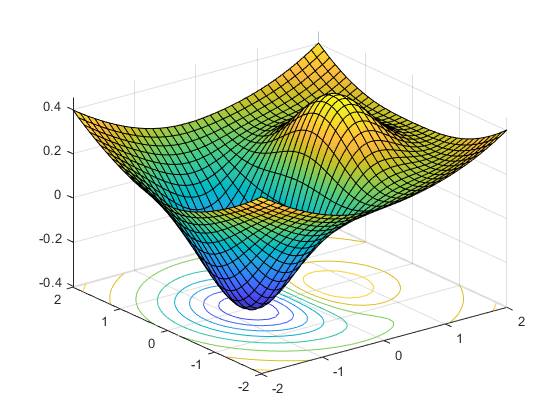 This function is a shifted and scaled version of the original objective function. %BOWLPEAKFUN Objective function for parameter passing in TUTDEMO. %NESTEDBOWLPEAK Nested function for parameter passing in TUTDEMO. In this method, the parameters (a,b,c) are visible to the nested objective function called nestedfun. The outer function, nestedbowlpeak, calls fminunc and passes the objective function, nestedfun. You can see both methods produced identical answers, so use whichever one you find most convenient. The inequality constraint is satisfied at the solution. %   Copyright 2008-2009 The MathWorks, Inc.
Set optimization options: we continue to use the same algorithm for comparison purposes. We also set options to use the gradient information in the objective and constraint functions. Note: these options MUST be turned on or the gradient information will be ignored. There should be fewer function counts this time, since fmincon does not need to estimate gradients using finite differences. fmincon estimated gradients well in the previous example, so the iterations in the current example are similar. more accurately by overriding the default termination criteria (options.StepTolerance and options.OptimalityTolerance). We continue to use gradients. The default values for fmincon's interior-point algorithm are options.StepTolerance = 1e-10, options.OptimalityTolerance = 1e-6. Override two default termination criteria: termination tolerances on X and fval. We now choose to see more decimals in the solution, in order to see more accurately the difference that the new tolerances make. If you give not only a gradient, but also a Hessian, solvers are even more accurate and efficient. fmincon's interior-point solver takes a Hessian matrix as a separate function (not part of the objective function). The Hessian function H(x,lambda) should evaluate the Hessian of the Lagrangian; see the User's Guide for the definition of this term. Solvers calculate the values lambda.ineqnonlin and lambda.eqlin; your Hessian function tells solvers how to use these values. The tolerances have been set back to the defaults. There should be fewer function counts this time. There were fewer, and different iterations this time.